This is day four in my 30 day blogging challenge. My goal this month is to post one recipe every day. You can see day one here, day two here and day three here. These recipes feature natural colorants and additives and are scented using natural essential oil blends. Because this soap gets hard, its best done in individual cavity molds. So let’s get started! 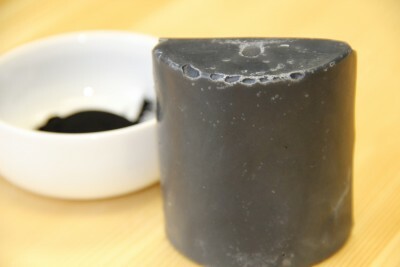 Charcoal – Charcoal is drawing and helps to remove oil and sebum from your pours. Sea Salt – Sea salt is purifying, drawing and acts as an astringent. This website explains how it helps your skin here. Tea Tree Essential Oil – Tea tree is anti-bacterial and anti-microbial making it a great zit-busting oil to use in a facial bar. Tea tree, teamed up with charcoal, seams to help with acne. *If you are selling your soap, be sure not to make medical claims. When using facial bars, lather up with a luffa. Allow the soap lather to sit on your face (like a mask) for a bit before washing off. This will allow the ingredients to work their magic. Coconut oil – 20 oz. This recipe uses a higher amount of coconut oil to make sure its nice and lathery with the added salt. We used a 10% superfat to leave unsaponified oils in it to combat the drying effects of high coconut oil. Its not a full blown salt bar; you can find recipes for those here as well. I also use more water in this as coconut oil can move fast with a water discount. The lather on this bar is nice and lotion-like. It doesn’t produce super fluffy lather as salt is a lather killer. New to soapmaking? Visit our basic tutorial here. Step 5 – Add essential oils and additives to the melted oils. Stick-blend to get rid of clumps if any occur. Step 8 – Unmold, cut and cure your soap for at least four weeks. pssssst – Do you want more cold process soap recipes featuring natural additives and essential oil blends? 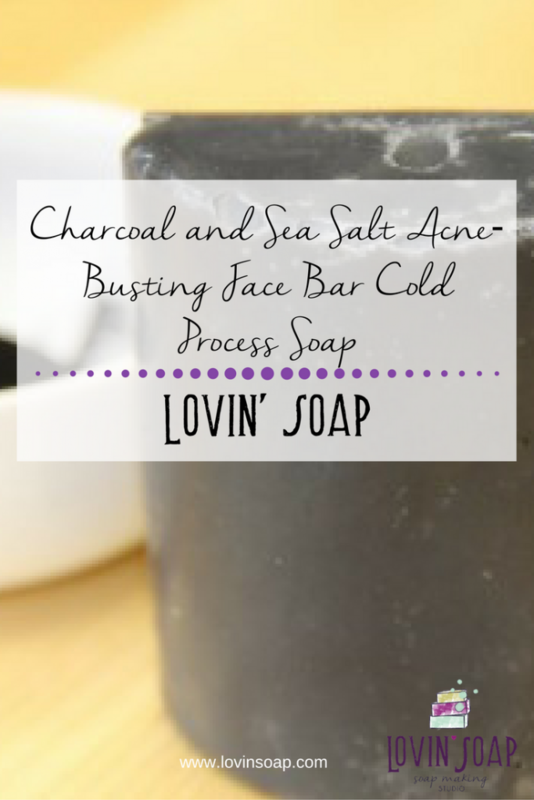 Check out Lovin’ Soap Studio Cold Process Soap Recipe Book! This recipe book contains 50 recipes for cold process soap and 64 essential oil blends. You can get it as a PDF eBook here or a printed book here. Are you looking for soapmaking, nail polish and other body care product classes in the Kansas City area? Check out our schedule. Our studio is in Downtown Lee’s Summit, MO. Would this recipe work if I exchanged the water for raw goats milk? Would I use 10oz of milk? My salt didnt not completely dissolve. I strained my lye water plus salt, and got about a Tablespoon of salt. Does everyone else’s dissolve? I did use Canning Salt , cause I have a bunch of it and was looking for some way to use it up. I used Lemon EO instead of Raspberry EO, cause my supplier doesnt carry Raspberry. I put im molds, and they came out beautifully 24 hrs later. Cant wait to try. Thanks for providing a palm free, animal product free recipe Amanda. Hey Donna, It’s Rosemary, not Raspberry. But Lemon is good too. Hi, Amanda! I made this recipe 3 times. The first time was most successful. I used a regular log mold, when cutting it crumbled a little, but I still had most of the bars intact. I LOVED this soap when I used it. BEST EVER! So I wanted more! TWO batches of crumbly mess! I will use those pieces because the soap is awesome, but I am wondering what was different. I followed the recipe exactly. I’ve heard that cutting salt bars as soon as they are hard and still maybe even warm works better.. Would this apply to this recipe? I loved the look of my first batch in the log mold. I used some left over soap batter in silicone molds and did not like the look so much. Any suggestions? I made this again today–third attempted batch after the first good one. I un-molded (came out easily) and cut when still slightly warm after about 51/2 hours. The batch cut perfectly. like butter! Looks beautiful! Thank goodness! I LOVE how this soap makes me feel clean all day! Made it and love it! Thanks for sharing the recipe. Amanda, what temperature do you cool it to and also when you make yours do you put it on heat or just wrap in towels ? I made this as a HP batch tweaking a bit and used hemp in place of the avacado. It’s lovely!! This recipe looks amazing! What does the salt do in the bar? Especially since the instruction is to lather the bar on a luffa and not directly on the face, makes me wonder what the soap adds to the bar? Hi Amanda, I made this soap and it turned out awesome. I changed up the essential oils some and it did heat and cracked a little but uncovered and it turned out wonderful and looked shinny and like granite. I was wondering if you could tweak this with using some different clays for color along with the charcoal and do a swirl or something. The recipe seems great . I want to make 2 pounds batch. How much essential oils do i need? I made this soap and followed it to the letter but it is currently exploding through a big crack in the center (it is in a round PVC mold) Is this soap going to be unusable? I made this soap last night and followed the recipe to the letter. I mixed at approximately 100 degrees and put it to bed under blankets and towels on my dryer. When pouring it into molds, it was very black and glossy. When I unmolded it today it was grey and dull. It’s not awful but I really hoped for a stunning, glossy, bkack bar. What can I do differently to achieve this? Can this recipe be made with goat milk? after how much time this acne soap expire? for how much time this acne soap expire? I’m new to soap making and this looks like a great recipe to try! I love that it’s palm oil free. Can you tell me how many pounds this recipe yields (as is) ? Thank you! Hi Jenn! You’ll love making soap! To find out how much a recipe yields, you simply add up all of the ingredients. (Oils + Lye + Water) So this recipe will yield 46.7 oz of soap. Divide by 16 to get pounds. So it will equal 2.9 pounds of soap. I really enjoy your website and the eBooks I’ve gotten from you so far. Thanks for your time & sharing! I LOVE this Charcoal recipe! I followed the instructions exactly & it is wonderful! I found I prefer it gelled & it cut better on the batch I gelled. Did it make anyone’s face worse or is my skin just extra sensitive? Nevermind, I think my skin was detoxing. 🙁 It’s back to normal now! I just made this and it took forever to trace-and barely traced at that…..Why is this? Hi! I just did this recipe and it turn out to be a light green, not black. I follow all the recipe as mention, did put the charcoal. Having a light color soap I’m pretty sure it won’t turn darker when unmolding, do you know what could have happend? Hi Michele! It could be the type of charcoal you used or the supplier. YOu can always add more next time to up the black. When you’re mixing charcoal soap, what you see is what you get. So if it isn’t dark enough when mixing, add some more. Hi! I just made this soap, and had a quick question. I followed the recipe exactly, but after pulling it out of the molds and letting it sit out for two days, I cut it and it’s really crumbly. Do you have any idea what caused that? If your soap is crumbing, it could be lye heavy. Test it with a pH strip, or do a tongue test (lightly touch your tongue to the soap, and if you get a small zap, your pH is off). I thought about that, but since I’ve made a lye heavy batch of soap before I couldn’t really see the resemblance between the two. Still, I’m going to do a bit of testing on it (your suggestion is a good one 🙂 ) to see if that may be it. However, on the second batch I chose to use round PVC pipes for round bars. I soaped warmer, between 105-110. I set my molds upright in a box heavily encased in waded newspaper to insulate, and covered them also. These DID go through gel stage. I noticed they were much more solid to cut and have a nicer shiny surface too! I tried this soap last night, but substituted almond oil for avocado oil. There were no problems and I poured it into the molds. When I checked it this morning the soap had not hardened and was actually crumbly and spongy. Its also a light gray color. Any idea what may have gone wrong? Hi Suzanne! Did you happen to use dead sea salt? Dead sea salt doesn’t work in CP soap and will cause the soap to be soft and spongy. That is all I can think of. This recipe works well for me. I’ve haven’t tried a salt soap recipe yet but have heard that it hardens very quickly. I’m wondering, with only the two tablespoons of sea salt will it harden as quickly as recipes with 50-100% salt? No, not as quickly at all. Would substituting 5% of the olive oil for castor oil increase the lather? Or would the salt just kill all of the lather anyway. Thanks Amanda! Looks like a great recipe. Looking forward to giving it a try over the weekend. What type of Coconut Oil did you use in this recipe? Hello Jane! I used coconut oil – 76 degree melt. Would it be ok to use extra virgin OO?